McALLEN — Sean Skaugen’s most difficult hurdle to clear as of today had nothing to do with track and field. But because he cleared it, he will continue to face hurdles, but now at the Div. I level. 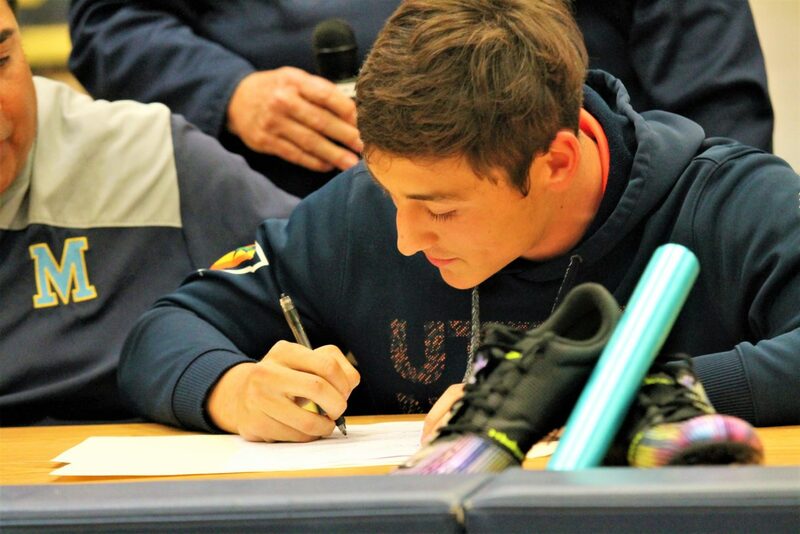 The McAllen Memorial track star and football player signed his letter of intent Thursday to run track with the University of Texas — Rio Grande Valley, part of the Western Athletic Conference. There was a time, about five months ago, where Thursday’s series of events were up in the air; Skaugen, his coaches and family couldn’t be sure that athletics would be the same for the senior hurdler and quarterback. Skaugen suffered a back injury early in most recent football season that sidelined him for the remainder of the year. “That was devastating,” Memorial track coach Tom Niemeier said. “But no matter what, we kept being positive and encouraging to him. He was our go-to guy in football and such a presence on the track team. When you’re talking injuries to the hamstring or ankle, that’s one thing, but when it’s a fracture around the vertebrae, you have to rely on the athlete to communicate with you what he’s going through, how the pain is. Skaugen expects to run the hurdles for the Vaqueros, focusing on the 110-meter hurdle, his specialty in high school, where, as a junior last year, he was the District 30-6A champion and went undefeated in the event in the Rio Grande Valley. He was also an area qualifier, champion and regional qualifier. As a sophomore he was the runner up in the District 30-6A meet and advanced to the area round. His skills weren’t limited to that event, however. He was the 300-meter hurdle champion and an area and regional qualifier; he also qualified for area and region in the 400-meter relay and the long jump as well. On the gridiron for three seasons — his last one cut short due to the injury — Skaugen ran for 2,042 yards on 198 carries (10.3 per attempt) and scored 23 TDs. He passed for 1,167 yards and 14 TDs, according to Max Preps. The team won two district titles and advanced to the state playoffs all three years. It sure doesn’t sound like the same Skaugen who decided to run hurdles as a young kid when first introduced to the sport during the city’s summer track program. Now, those hurdles are what he hopes to be a stepping stone to running the decathlon for UTRGV. He has some clear goals set out for his college career.